This week’s Lid Radio Show (3/22) is extra special. 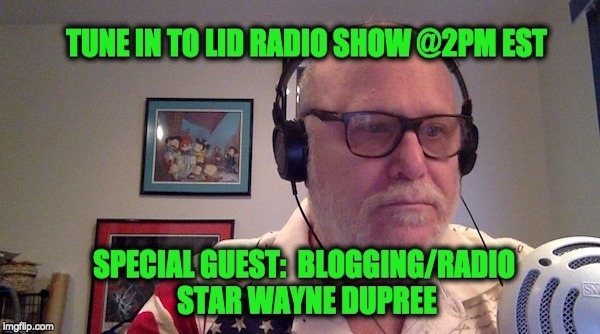 Our guest is Wayne Dupree: political pundit, superstar blogger, award-winning radio host and the founder of WAARadio – We Are America Radio, social media power influencer, fellow Liberty Alliance blogger, and as a Gulf War Veteran (U.S. Air Force) in other words, he’s a person who put his arse on the line to protect all of us. There’s plenty for Wayne and me to talk about…. Russians we have colluded with, the MSM’s attempt to de-legitimize Pres. Trump, Ted Cruz’s man-crush on Judge Gorsuch, Can Maxine Waters be impeached?, what will Chuck ‘The Obstructor’ try to delay next, and of course any breaking news. Wayne is a leading national conservative voice. 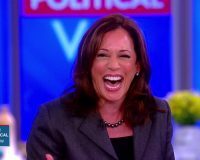 He is also a member of Project 21, a black leadership network, is a regular contributor to The Political Insider, Headline Politics, Townhall.com, NewsmaxTV and the One America News Network. He has been personally sought out by FoxNews Sean Hannity Black Conservative Special and Fox & Friends, as well as appearing on two Glenn Beck Specials, and was a National Spokesman at Citizens For Trump, Dupree has also been a radio guest on nationally syndicated shows hosted by Mark Levin, Sean Hannity, and Steve Malzberg. Most importantly he is an insightful observer of today’s political scene, a great American, and a good guy. 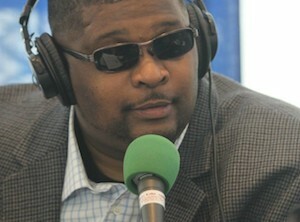 His website, http://waynedupree.com reaches nearly 1,000,000 views per month. Wayne’s internet radio show, “The Wayne Dupree Show”, hosts a veritable “Who’s Who” of conservative politics, including Dr. Ben Carson,Col. Allen West, Michelle Malkin, Dinesh D’Souza, and a host of other newsmakers (including yours truly) . Wayne earned “Best in Show: Podcast” award by National Bloggers Club in 2014, and was named Blogger of the Year in 2015 by the American Conservative Union. Dupree’s WAAR radio (We Are America Radio) network continues the growth of “New Media” in conservative circles by adding a strong conservative voice adding his commentary to current events and challenging the progressive policies, and the establishment of both political parties. Wayne founded the network and broadcasts live Wed., Thurs., and Fri., live at 9-10 PM Eastern. Wayne’s true home is social media. Along with his successful website Every day, Wayne directly interacts with over 166K followers on Twitter and with over 54K Facebook friends, and he is a frequent speaker at Tea Party and other conservative rallies across America. Join Wayne and me at 2PM EDT today, Wednesday 3/22 at SHRMedia or High Plains Talk Radio. Or you can use the player (and chat room) embedded below. Listen to today’s Lid Radio show at SHRMedia or High Plains Talk Radio. Or you can use the player (and chat room) embedded below.